↑ The United States did not ratify any of the treaties agreed to at the Paris Peace Conference. ↑ Bulgaria joined the Central Powers on 14 October 1915. ↑ The Ottoman Empire agreed to a secret alliance with Germany on 2 August 1914. 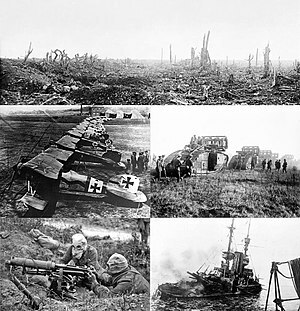 It joined the war on the side of the Central Powers on 29 October 1914. ↑ The United States declared war on Austria-Hungary on 7 December 1917. ↑ Austria was considered one of the successor states to Austria-Hungary. ↑ The United States declared war on Germany on 6 April 1917. ↑ Hungary was considered one of the successor states to Austria-Hungary. ↑ Although the Treaty of Sèvres was intended to end the war between the Allied Powers and the Ottoman Empire, the Allied Powers and the Republic of Turkey, the successor state of the Ottoman Empire, agreed to the Treaty of Lausanne.